ARE YOU UP-TO-DATE ON PREP? PrEP is the third point of Governor Andrew Cuomo's plan to end the AIDS epidemic in New York STate. 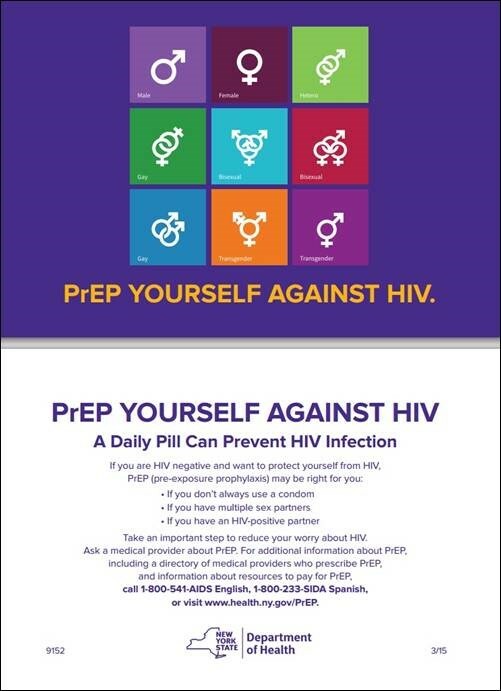 Please check the online resources related to PrEP developed by CEI and other programs. The AIDS Institute Materials Initiative is pleased to announce new materials on pre-exposure prophylaxis (PrEP). These materials consist of a brochure and a card entitled "PrEP Yourself Against HIV" and are available in both English and Spanish. To view and download these materials, please visit www.health.ny.gov/PrEP. This website also includes other important information including fact sheets for non-clinical providers, information on PrEP-AP, and the New York State PrEP/PEP Provider Voluntary Directory. To order these materials for your health agency, please call the AIDS Institute Materials Initiative at 518-474-3045. The CEI HIV/HCV Center for Excellence provides PrEP clinical cards. This convenient card provides clinically relevant information on the recommended PrEP regimen, pre-prescription assessment, information on lab tests and monitoring, the New York State Clinical Consultation Line, as well as the website addresses for further information regarding PrEP guidelines and CEI initiatives. This card can be discreetly attached to a medical providers name tag while providing all of the important information needed to make clinically sound decisions regarding PrEP.